An essential item in your contemporary-style home, this stationary sectional offers bold style and plush comfort all-in-one. From plant-based, polyfoam cushions to tapered track arms and high metal legs, this sofa has the look and feel you need to create an exciting and inviting place to lounge. 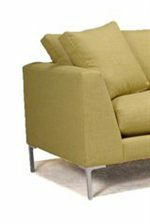 Its right-arm-facing chaise makes it easy to kick back with your feet up, while its left-arm-facing sofa leaves plenty of room for relaxing with family and friends. The perfect addition to your family room or entertainment area, this 2-piece sectional will complete your home. The 0351 Contemporary Sectional Sofa with Metal Legs and Right-Arm-Facing Chaise by McCreary Modern at AHFA in the area. Product availability may vary. Contact us for the most current availability on this product. 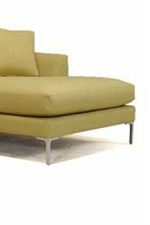 0351-CR Right-Arm-Facing Chaise 1 60" 44" 32"
0351-SL Left-Arm-Facing Sofa 1 80" 36" 32"
Bring striking, new style to your living room or entertainment area with the 0351 collection. Featuring a stationary sectional and matching cocktail ottoman, this collection creates the perfect group setting for parties and movies nights. Marked by crisp lines and high metal legs, this collection's fresh, modern vibe will set the tone of any room. But complete with plush, polyfoam cushions and matching throw pillows, the 0351 collection is guaranteed to keep everyone feeling comfortable and relaxed. With the style you strive for and the comfort you can depend on, the 0351 collection is one you can't live without. The 0351 collection is a great option if you are looking for Contemporary furniture in the area.